There’s good news and bad news, said Jill White, with Commonwealth Assisted Living (CAL) at Farnham Manor. The good news is we’re living longer, but our bodies are getting older and need more help. And increasingly, growing numbers are afflicted with dementia, a disease that could bankrupt the country, she says. 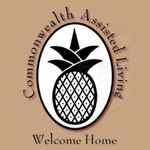 Jill spoke about various options available at Commonwealth at Farnham: staying at home with help, independent villas, and long-term and respite stays in assisted living, or the “Sweet Memories” memory care household. Caregiver Support. She focused on the 24/7 overwhelming job that faces family caregivers, particularly for people with dementia. CAL at Farnham has a monthly support group for caregivers (4th Thursday, 3-4 p.m.) open to anyone. It offers emotional support as well as help connecting to helpful resources, such as V.A. assistance and grants from the Alzheimer’s Assn., and other information. To obtain a list of other caregiver support groups contact the Alzheimer’s Association. With stories, Jill related some of the trials of caring for someone with dementia. “It’s a family disease,” she said. A gentleman had trouble with his wife who became agitated at bedtime, but he panicked when he awoke at 2 a.m. to find her trying to climb out a second-story window. A representative from the Alzheimer’s Association was called in and could see it differently and more impartially. It became clear that the woman thought of herself as a very young woman, who wasn’t supposed to be in a bedroom with a man. When he reluctantly agreed to sleep in a different room, that problem was resolved. Often, dementia patients take a long time to respond, Jill said, and that requires patience: “We have to step back from the task we’re doing, and focus on the person, instead.” She described a painting project in an assisted living community, where a woman sat for a long time with unused paint brushes and paper before her. When staff was about to suggest they remove the woman, she suddenly picked up a brush and began painting blue bars on her paper. Sometime later, the blue bars, with yellow dots added, became the skyscrapers of New York framed against a glowing sunset – the woman grew up in New York and was able to capture her memory of it. Jill showed us a picture of the drawing, which wouldn’t have happened without the allowance of time for the resident to respond in her own time. You can reach Jill White at 804-394-2102 or email jwhite@commonwealthal.com.